Floor Frog Covers:- Benton county, Jones, County, Linn County, Cedar Rapids, Marion, Hiawatha, Robins, Vinton, Anamosa, Atkins, Belle Plaine, Cascade, Center Point, Central City, Ely, Fairfax, Lisbon, Monticello, Mount Vernon, Springville, Urbana, Walford, Alburnett, Blairstown, Coggon, Keystone, Newhall, Norway, Olin, Oxford Junction, Palo, Shellsburg, Van Horne, Walker, Wyoming, Swisher, Bertram, Center Junction, Garrison, Luzerne, Martelle, Morley, Mount, Auburn, Onslow, Prairieburg, Johnson County, Washington County, Iowa City, Coralville, North Liberty, Kalona, Solon, Tiffin, Wellman, West Branch, Hills, Oxford, Riverside, Swisher, University Heights, Coppock, Crawfordsville, Shueyville, West Chester, Cosgrove, Elmira, Frytown, Joetown, Morse, Oasis, River Junction, Sharon Center, Sutliff, Windham. Although Floor Frog has an internet presence we are not internet based. Please get in touch for free advice, or to arrange a free quote. Based and operating in the Cedar Rapids/ Iowa City areas. Call or email to arrange a free home consultation. And other areas on request. 1. What is laminate flooring, engineered wood flooring, solid wood flooring and LVT? 2. Is solid hardwood always the best option? 3. Choosing between solid hardwood flooring, engineered hardwood, laminate flooring and LVT. 4. Can I use hardwood or laminate flooring in my bathroom or kitchen? 5. Will thicker laminate floors last longer? 6. Will thicker underlayment make my floor feel springy? 7. What Goes under my laminate or hardwood flooring? 8. Are laminate and hardwood floors cold? 9. What happens around the perimeter of the room and under door jambs? 10. Will installation be dusty? 11. If I buy some flooring will you really install it? 12. What should I look for when buying flooring? 13. Why do I only recommend Mohawk/Uniclic? 14. How do I care for my Laminate flooring or hardwood flooring? 15. How can I repair my hardwood or laminate floor? 16. Do I need a building permit? All work guaranteed, in addition to manufacturers guarantees. Quality workmanship with clean working practices and with a good eye for detail at sensible prices. Quickstep quality laminate flooring, global market leader. “it is clear that he takes pride in his work”. “does everything he can to keep the work area clean and minimize dust”. Keith completed several jobs for us and we are very pleased with him both as a businessman and as a craftsman. He does great work, shows up on time, works hard, and gets the job done in a timely fashion. He exceeded our expectations when he went out of his way to return flooring to our supplier when it arrived broken (no fault of his),……………We will likely used him again in the future and plan to recommend him to friends as well. Thank you, Keith! Keith is a wonderful flooring guy. Pay attention to details and being patient to our tons of questions to find product that fit our needs. 1. What is laminate flooring, engineered hardwood flooring, solid hardwood flooring and LVT? Basically laminate flooring, engineered hardwood flooring, solid hardwood flooring, bamboo flooring and are all wood based products. LVT is a vinyl product. Laminate flooring consists of layers of fiber or particle board with a decorative layer and a clear wear layer to prevent scratches. The hardwood, tile or stone pattern you see on the surface of the flooring is actually a printed piece of paper. Laminate flooring is very tough and resists heel damage. Further info here. Engineered flooring comes in many qualities but the common thing about engineered floors is a layers of real hardwood or wood based boards. The surface of the floor is a slice of real wood. The thickness of the slice determines the quality and price of the end product. This can vary between paper thin to 1/4 inch The core of the engineered flooring board can vary also, from fiber board to blockboard to plywood. Solid hardwood is simply a plank of hardwood that has usually had a tongue and groove milled into it, This enables it to be blind nailed down. Bamboo flooring can come in solid or engineered varieties. Technically and pedantically it’s a grass, but most people call it wood. There are 3 types of “solid” bamboo, each type consists of bamboo that is processed and stuck together to make a solid mass. These are horizontal, vertical and strand woven. Horizontal and vertical refers to the orientation of rectangular cross section bamboo lengths which are stuck together. Strand woven bamboo has random strands of bamboo pressed together and glued. LVT or luxury vinyl tiles are waterproof, again they have a layered construction, all the layers are PVC vinyl. On the base layer a decorative layer of vinyl is applied and then a wear layer of clear PVC vinyl is added.. The main problem with solid hardwood flooring is it absorbs moisture from its environment causing the wood to swell. During the normal yearly cycle of drying and wetting you might expect your solid hardwood floor to creak a little and for joints to open and close. Solid hardwood floors have to be fixed to the existing floor somehow, normally by nailing. Over concrete the floor cannot be nailed, so must be bonded to the floor, however this is where the problems start as concrete subfloors can attract moisture from the air (dew point) and pass it directly into the wood causing it to swell and cup. Solid hardwood flooring is not specifically designed to be floated over or bonded to concrete or asphalt. Engineered hardwood flooring is. Solid hardwood can not be installed in your basement, engineered hardwood flooring can safely be installed below grade in basements. Solid hardwood flooring tends to come in random lengths some of which are quite short, Engineered flooring is available in longer wider lengths than in solid hardwood flooring. Engineered hardwood flooring, is much more suited to basements and is made with a thick slice of real hardwood on a more stable base, it can be safely fitted over concrete and particle board sub floors. Once an engineered hardwood floor is fitted it looks and feels like a solid hardwood floor. There is a misconception that engineered flooring is the cheaper option, because it's not solid all the way through, just remember it's flooring not gold jewelry. Engineered hardwood flooring can be slightly more expensive than solid hardwood flooring, but if you're fitting it over concrete the installed prices are lower for engineered flooring. Engineered flooring is made to very high tolerances and comes in a whole range of qualities, it tends to develop gaps between boards less and in some cases the wear layer is the same thickness as solid hardwood. There is no easy answer to this one, but if I give you the facts, you should find it easier to make an informed decision. Hardwood is beautiful, and by comparison laminate and LVT can look a little fake. However laminate floors are getting more realistic, and some even have a glow similar to real wood. Real hardwood is softer than laminate flooring and is more susceptible to damage and scratches, however damage to wood seems more acceptable, and in time hardwood floors can be sanded and refinished to look like new again. Laminate floors and LVT cannot be sanded or refinished. Some cheaper laminates can give static electricity shocks (not Quick-Step). Wood does not. MORE INFO CLICK HERE. Then of course theres cost, Laminate and LVT floors and certain engineered floors can give a great instant hardwood look inexpensively. 4. Can I use hardwood or laminate in my bathroom or kitchen? YES.... providing you buy the correct flooring. Note: there is a massive difference in performance between water-RESISTANT flooring and water-PROOF flooring. Quick-Step claim their joinery system is so good it prevents water from penetrating the joints coupled with a high quality core material this means the whole quickstep range and also Pergo is fine in most kitchens. Bamboo flooring is extremely resistant to water damage however like solid hardwood it's not as tough as laminate. Click seal is a product that can be used to seal the joints of your laminate floor making them more resistant to water damage. Click seal still allows glueless laminates to be disassembled. Many water resistant ranges perform quite poorly in wet conditions although the core material is water resistant, the type of joint is loose enough to allow water to penetrate and cause damage. Standard Laminate and hardwood flooring does not perform well under wet conditions. LVT is ideal for bathrooms. There is a misconception that thicker laminates perform better. There are some laminates on the market, that are 12mm thick. Some of these laminates have poor joint mechanisms. Its the thickness of the wear layer that's important, not the thickness of the board itself. Of coarse thicker boards sometimes have bigger joint mechanisms, and can hold together better. Thicker boards are also stiffer, but since laminates must be fitted on a perfectly even surface, this is irrelevant. Generally:- 6mm is too thin for laminate flooring (and this is reflected in the price). 8 to 10mm laminates are very good. 10mm plus laminates are not much better than 8mm alternatives. Don’t pay a premium for bulky ballast on the back of thinner laminates. The only positive about the thicker laminate floors (12mm) is they sound better when you walk on them. Laminate flooring must be fitted on a perfectly flat surface, otherwise it will feel bouncy. Any un-evenness must be dealt with before installing your new flooring. Another reason why your Laminate feels springy is that it has expanded and become "locked in", it no longer fits in room where it was originally laid and is now lifting up in the center. 7. What goes under my laminate flooring or hardwood flooring? Laminate is fitted as a "floating floor " it is not fixed down at all. In most cases engineered hardwood and solid bamboo floors are fitted as floating floors. The final feel of the floor is very much dependent on the subfloor it is fitted on. Uneven sub-floors will result in bouncy floors, and in most cases manufacturers have very strict guidelines on subfloor flatness. Underlay (pad) will to some extent level minor bumps and dips. In most cases the use of a vapor barrier is recommended to separate your very dry laminate/hardwood from any chance of moisture present in most subfloors. Some underlays have an integrated vapor barrier these are called combi underlays. •White foam: If its any less than 2mm its pretty worthless. •Fiber boards: From 5 to 7mm thick theses tiles are easy to fit and can be used to level particularly uneven floors, good sound and heat insulation. But needs separate vapor barrier, and sometimes can cause problems when joining on to other thinner floor coverings. Your doors may need trimming too. •Quick Step Combifloor: This 3mm combi underlay provides good value for money. •Quick Step Unisound: This 2mm dense combi underlay is designed to make your floating floor sound more like a solid fixed floor. •Quick Step Realsound: This 2mm combi underlay is ideal for bedrooms and flats to help stop noise being transmitted downstairs, without the extra height of fibre boards. 7a. What goes under the solid hardwood flooring? Solid hardwood floors are normally fixed directly to the subfloor by gluing or nailing. 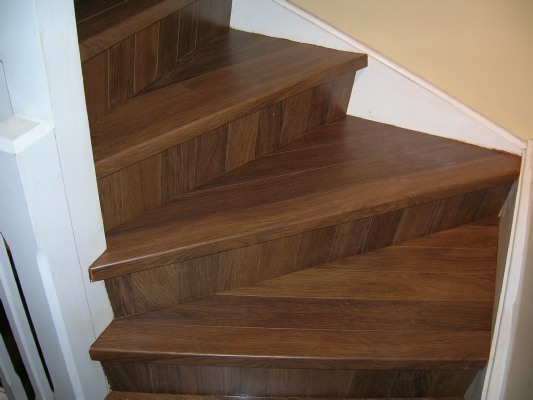 Engineered and bamboo floors can also be fitted like this too. If your subfloor is particle board then ply or osb underlayment must be installed 1st. There are certain solid hardwoods that can be floated over the underlays described on the previous page. These hardwoods are machined with locking systems like laminates or use steel clips to join them together. They do not glue tongue into groove. Any solid hardwood can be fitted “floating” using elastilon (a sticky foam underlay), but this only for very simple room layouts. Any ceramic tile and vinyl, cushion floor, LVT fitted over concrete will feel always feel cold compared to laminate and hardwood. Hardwood is slightly warmer to the touch than laminate. Laminate and hardwood floors need to be fitted with an expansion gap all round the perimeter of the room. Larger rooms need larger expansion gaps, and solid hardwood needs larger gaps than engineered and laminate flooring. The easiest and cheapest way to cover this expansion gap is to use quarter round molding (either matching the floor or matching your baseboard). It is always neater to NOT use molding to cover expansion gaps. This can be done by, trimming the bottom off your existing baseboards in situ and sliding the new flooring underneath or removing and refitting /replacing baseboards. Sometimes it may be necessary in a solid hardwood installation to install shoe molds where the baseboards don’t provide enough cover for the expansion gap. When fitting solid hardwood it is highly recommended to remove and refit baseboards or undercut your existing baseboards to allow the wood to expand. 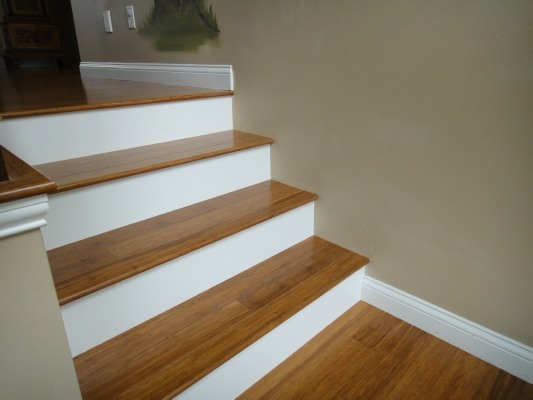 For Uniclic, bamboo and solid hardwood flooring I can trim the bottom off the baseboards without removing it, then slip the new flooring under the baseboard without using any quarter round molding. Baseboards can be supplied to match most of the flooring. In most cases baseboard can be removed very easily with no or very little damage to either wall or skirting board. Any minor damage to the wall is covered by the new higher position of the skirting. Replacing baseboards is not a very expensive option. I always trim the bottom of door jambs and slip your new flooring under for the neatest finish possible. 10. Will it be dusty? General advice for having work done. I endeavor to minimize dust. The dustiest part of the installation is the preparation of the room in which the flooring is to installed. I do use a Festool dust extraction system on all of my power tools. The actual cutting and shaping of the flooring is practically dust free. Yes I will! I can install and repair, laminate, bamboo, engineered hardwood, solid hardwood, floating LVT. I would prefer to install certain brands of flooring, because frankly they go together better (these are mostly the brands that I sell). I have fitted many brands in the past and can achieve a professional finish no matter what you buy. If you're going to buy your own laminate flooring, check that the laminate is stored correctly. It should be laid flat and in a dry place. Check the packaging for damage (specially the corners and ends). Check that the cardboard packaging is crisp and dry;- soggy cardboard means damaged flooring. Look for the Uniclic logo for easy to fit, quality laminate flooring. In my opinion Quick Step is the best laminate for the domestic market available today. 13. Why do you only recommend Mohawk/Uniclic? There are only 2 types of glueless laminate systems available. These are Uniclic and Fiboloc/Valinge. Only Uniclic can be fitted gluelessly under doors and doorjambs. The Fiboloc system has to be altered and glued to get a professional finish under doorjambs. (not my idea of glueless). Only Uniclic holds the boards together under constant tension. This makes the joints more resistant to water and ensures boards stay where you want them. There is nothing worse than spending hours lining up the grout joints in tile effect laminates only to find boards easily move out of line if they are Fiboloc joints. Unfortunately Uniclic tends to be more expensive, however this also means the Uniclic system is used on the better quality laminates. All the above products use the system. If you don’t see the Uniclic logo on the packaging or you don’t see:- made under licence from UNILIN. (sometimes it's in tiny writing), then you can assume its FIBOLOC. 14a. How do I look after my new flooring ? 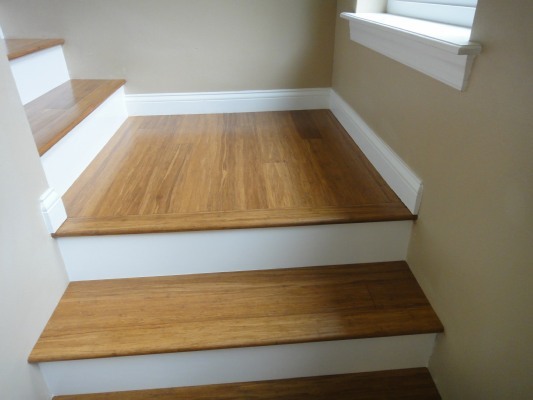 General care for all laminate, hardwood, and bamboo floors. • Use felt or plastic caps under furniture to prevent scratching your floor. For laminate floors; between 50 and 65% R.H . Even though Uniclic is anti static, if the air in your home is very, very dry you may experience static. To cure this use a humidifier during the winter months. For real hardwood floors; between 35 and 55% R.H. especially Solid hardwood floors as they can react quite badly to changes in humidity levels. • Use a soft brush or cylinder vacuum (or upright vac with rotating brush turned off). • Use disposable static cleaning tissues e.g. SWIFFER. • Use disposable damp cleaning tissues eg, PLEDGE. AND ALWAYS WIPE DRY IMMEDIATELY. • WET MAINTENANCE WILL RUIN YOUR FLOOR! • Do not use scouring products. • Laminate has a smooth surface which will not hold dirt or dust. • NEVER use wax or varnishes on laminate flooring. • Stubborn stains can be removed with a little acetone (nail polish remover). • During winter months when the heating is on try to ensure your hardwood floor does not shrink too much by using a humidifier. • In summer especially late summer your hardwood floor may take on excess moisture from the air and begin to swell which will initially cause creaking and if left unchecked could permanently damage your floor, to prevent this use a dehumidifier or simply turn the heating on every now and then. • Pets:- keep dogs nails clipped short to prevent scratches. • Stiletto heals can damage hardwood flooring, as can footwear with damaged heels, check boots for any trapped pieces of grit or glass. •Waxed and Oiled hardwood floors need special treatment, wash with dilute natural soap, and apply maintenance oil. 15. How can I repair a damaged floor ? Hardwood and laminate floors can be easily and successfully repaired. Go to the repair pages here. Hardwood and laminate floors installations don’t require building permits. Click here for further info. Pergo is undoubtedly the most respected name in laminate flooring, they invented laminate flooring back in 1977. For a long time in Europe their flooring was the hardest wearing available and was used in public spaces. However Pergo have been struggling and loosing out in the bigger market of home improvement as their flooring tended to be very hardwearing, not the best looking stuff and very expensive. Pergo have addressed these issues by making better looking laminate for the home improvement market at more affordable prices. In the process the quality has gone down slightly but since Pergo where already way ahead of the competition this reduction of quality still means Pergo are producing laminate flooring better quality or equal to its best competition. Currently Pergo is owned by Mohawk Industries, who also own Columbia, Quickstep and Unilin. Pergo flooring is excellent flooring but so are its Mohawk companions (some of which are made in the same factory). In conclusion Pergo was amazing flooring but now its on a par with similar priced Columbia, Mohawk, and Quickstep flooring. This means with quality leveled throughout Mohawk’s products you can choose the best looking floor for your pocket and not have to worry about its quality.